While the official coffeeneuring is currently on hiatus, I thought I’d take a few posts to feature some of the outstanding coffeeneuring of some of our challenge participants. First up are Tara and Simon, the coffeeneuring duo known on Twitter as @whatsupwheaton. Reading about the places that Simon and Tara visited and the account of their routes, I realized that I need to take my bike into Maryland more often. Of all the places they visited, I was only familiar with one of them (Starbucks, big surprise). In addition, until receiving their writeups, I was unaware of the Silgo Creek Trail. 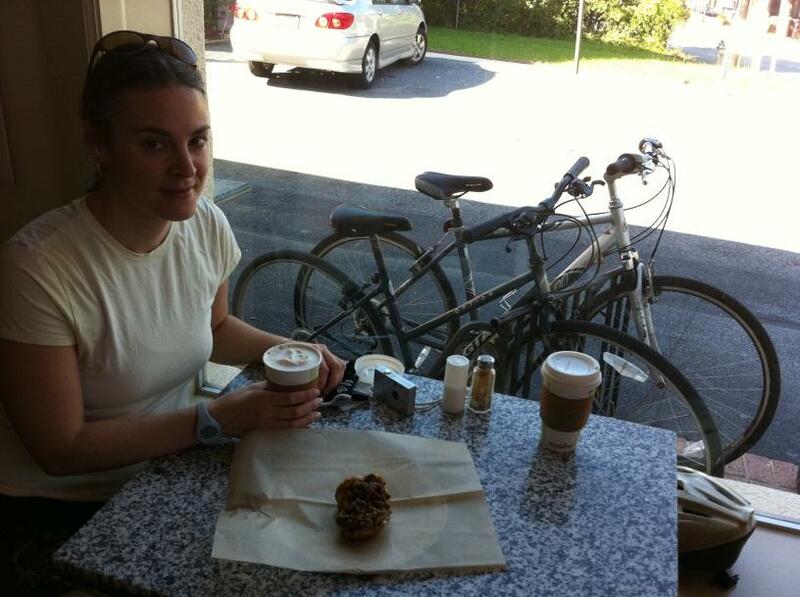 It’s also thanks to Tara’s inquiry that the Columbus Day Rule came to be (Columbus Day Rule: If a coffeeneuring challenge intersects with any weekends that include a holiday, you have three days to complete two coffeeneuring rides.). Thanks, Tara! 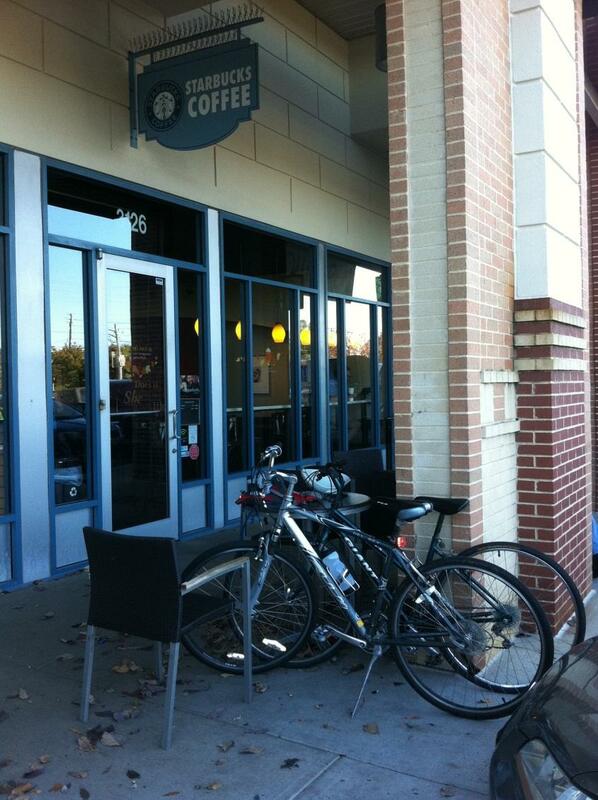 Today and tomorrow I’ll be sharing their coffeeneuring trips with you. Please enjoy and, if you live in the D.C.-area, keep some of these places in mind when you find yourself in need of a coffeeneuring fix! Thank you for organizing this challenge! It’s been a lot of fun to try to meet our coffee-ride goals and it’s really motivated us out to get out on our bikes enjoying what’s around us. On our rides, we mostly took advantage of the network of multi-use paths and trails in Montgomery County, Md. We’ve also included the Google maps of all of our rides, which we created using Cyclemeter. We checked in to all of the shops using Foursquare, so additional ride verification is available on Twitter: @whatsupwheaton. What we drank: Two medium coffees, plus a cinnamon bun. A little bit about our ride: From our house in Wheaton, we took suburban streets, Rock Creek Trail, and Georgetown Branch Trail to downtown Bethesda. The trails were relatively quiet that morning. Quartermaine is a small shop which always seems to be packed, usually with a line out the door, and this day was no exception. We sat on a bench right outside the shop while we sipped our coffee and people-watched. 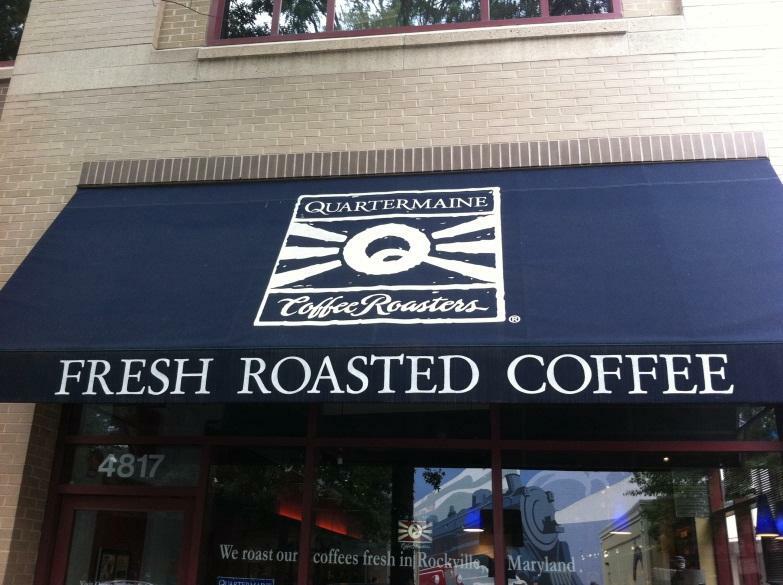 The coffee shop is right near the entrance to the Capital Crescent Trail, so there are lots of cyclists stopping for coffee at Quartermaine, Bethesda Bagels, and Dunkin Donuts. It’s fun to see bikes of all shapes and sizes lined up along the sidewalk of Bethesda Avenue. What we drank: Medium light roast and a medium café au lait, plus a miniature sticky bun. A little bit about our ride: From our house in Wheaton, it’s a quick trip down a suburban street to the Sligo Creek Trail. From there, we headed south to Takoma Park. It was a beautiful crisp sunny morning, so the trails were busy with joggers and dog-walkers, which was a good reminder that we need to put a bell on one of our bikes. Despite its name, Capital City Cheesecakes is primarily a neighborhood coffee shop. It is located in the spacious former Savory Café space, full of couches and tables. We sat at a table on the other side of the window from the small bike rack provided by the coffee shop, so we could keep an eye on our bikes while we finished the Washington Post crossword. Coffee was good, but we would have preferred the option of having our coffee in ceramic mugs, which weren’t offered. The coffee was served in biodegradable cups, which we dropped off in the café’s compost disposal setup. On our way home, we stopped by Green Commuter bike shop, which specializes mostly in electric bikes, and chatted with its friendly staff. What we drank: Coffee and a decaf americano. Zed’s Cafe. Best coffee shop coffee mugs! A little bit about our ride: Sligo Creek Trail south again, and then we cut across some streets in Silver Spring to reach downtown Silver Spring. We initially intended to visit Kefa Café, but it closed early for Columbus Day. A woman who was getting into her car right in front of Kefa recommended Zed’s, which is just around the corner on Georgia Avenue. It’s only been open for 4 months. Zed’s bills itself as the “neighborhood’s living room.” The owners have done a good job with comfy couches and tables of various sizes, as well as piles of magazines and other reading material. We ordered a regular and a decaf, but the only decaf coffee they had was espresso, so the friendly owner offered to make Tara an Americano instead. 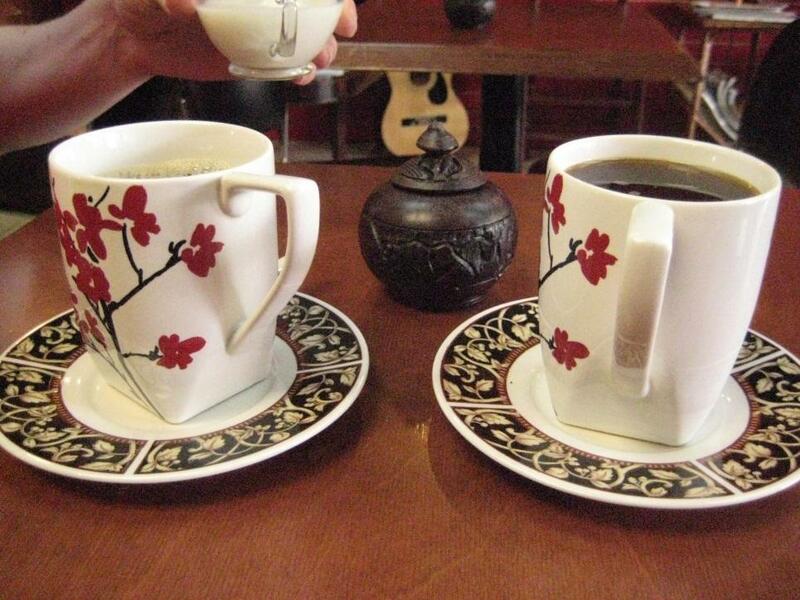 Coffee is served in beautiful mugs on saucers, adding to the true “living room” atmosphere. A little bit about our ride: The trip started out inauspiciously when, within the first two miles, Tara narrowly escaped being hit by both a car backing out of its driveway and a rather large falling branch on the trail. Fortunately, the ride got better. Gorgeous ride north on Rock Creek Trail, though a bit treacherous with wet leaves on the pavement, and then connecting to the new multi-use path alongside the Intercounty Connector. Then, quiet suburban streets to Olney where, unfortunately, there aren’t a lot of coffee options. We settled on a Starbucks in a shopping center, and enjoyed our coffee break sitting at a table overlooking the parking lot and Georgia Avenue. Tomorrow: The second half of the journey. We stayed pretty much to Maryland but managed different locales (and only one Starbucks). Thankfully Maryland is blessed with bike paths. Pingback: Rides for All Seasons « chasing mailboxes d.c.
Pingback: The Magic Coffeeneuring Map and Submission Housekeeping | chasing mailboxes d.c.
Pingback: Tara and Simon’s RAGBRAI Part 1 of 4: Why Iowa? | chasing mailboxes d.c.